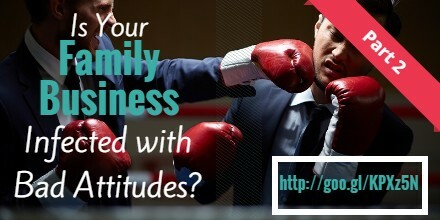 Home » Family Business Blog » Family Business » Is Your Family Business Infected with Bad Attitudes? Part 2: Selecting the right training program. Is Your Family Business Infected with Bad Attitudes? Part 2: Selecting the right training program. This is part 2 of this post. If you missed the first post, click here. Overcoming the first obstacle in defeating bad attitudes in your family business – is naming the training program. When you want to change a family member’s attitude through training, name the course so they will be excited and inspired to participate. Mandatory attitude training, for example, automatically causes resentment and resistance. Uncle Bad Attitude will say, I don’t have a bad attitude, why are they trying to fix me, or what did I do wrong to have to participate in this program. Like it or not, it is human nature to think the worst about these kinds of programs. Seminar titles like, “How to Stay Motivated all the Time” or “How to Be Better in All that You Do”, work well. It is helpful to take a measure of key attitudes that you want to change with the training. It is also useful to take the position that this effort is not just employee training for example, but long-term development because you want to change behaviors in the long run. You will want to assess the current state of the family business that leads you to want to change employees and possibly your own attitudes. What behaviors are occurring that are symptomatic of poor attitudes? It may be that you have observed or experienced behaviors such as short tempers, poor customer treatment, or disrespectful treatment of other family members, which may lead you to conclude that attitudes training would benefit your organization. A short survey (using a rating scale) of employees prior to training works well. Use questions that pertain to how they view the present environment and their own behaviors. This same survey can be administered several months after the training has been completed to see what gains have been made. You may not like your job or the family members around you. You may not even be able to change your position at the present time. But the one thing you can change is your attitude. Self-assessment and personal inventory- to include personal assessment of how well a family member feels they interact with others inside and outside of the family business environment. Developing Personal Effectiveness- to include opportunities for participants to visualize success and their own capacities and abilities, to strengthen inner resources and mental attitude. Transition and Change Model – Incorporate a process to help individual employees identify attitudes they want to change and a timetable that will let them transition that plan. True empowerment is the ability to take control and avoid knee jerk emotional responses to hostile work environments or the challenges associated with your family business. Remaining optimistic and positive are challenges that we all face in these circumstances. Attitude management is the ultimate productivity enhancement. Mastering the ability to maintain a positive outlook will draw others towards you and keep you motivated to achieve more in your business.